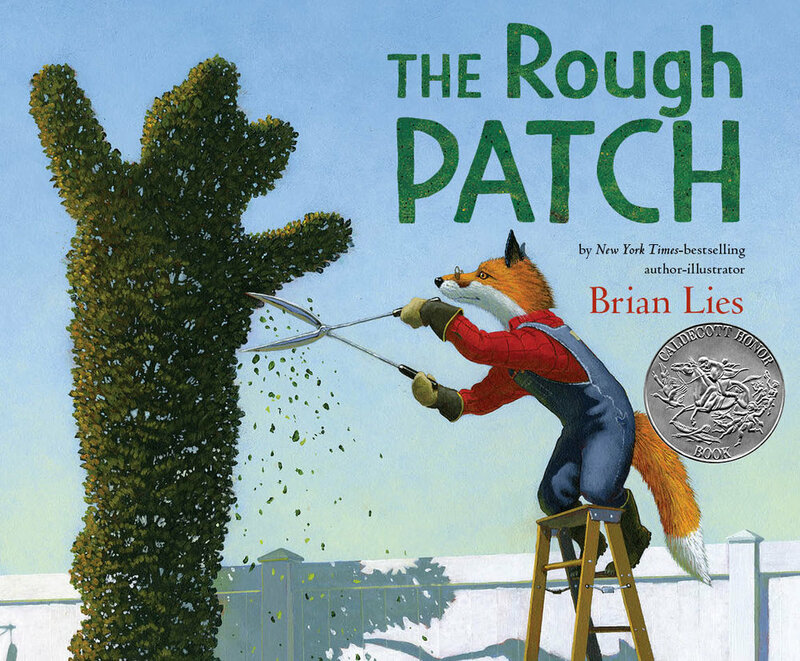 THE ROUGH PATCH is a Caldecott Honor Book and ALA Notable for 2019! Evan and his dog do everything together. They play and read and eat. But mostly you will find them tending to Evan’s extraordinary garden, where flowers and other good things flourish and reach for the sky. But friends don’t always stay forever, and when Evan loses his, he destroys the place that meant the most to them, and creates something to match his mood. Something ugly and twisted, sad and stubborn, ragged and rough—and he likes it that way. Until one day. . .
Everyone experiences loss, and Evan is no exception. Loss comes in many forms—someone moves, a friendship dissolves, a beloved object disappears. . and people die. We react to losses in our own way—and often dismiss anger as being part of the reaction. For Evan, the journey back to hope involves time and the healing power of nature. Read reviews of The Rough Patch here. The Rough Patch is now appearing in a number of blogs—check them out here. Listen to my discussion with Matthew Winner about gender representation in children’s picture books, why I draw animals, fox boots and why one would create a story dealing with hope after loss. Listen to an interview on the #ThinkActBe podcast —Seth J. Gillihan, PhD. and I discuss loss, hope and what went into making The Rough Patch. "Understated yet powerful, The Rough Patch is a story that stays with you." Bear never asks for anything. So when a mysterious letter arrives for the little chipmunk Izzy, urgently requesting her presence, she can’t refuse—even if there is a blizzard on the way! Will Izzy make it to Bear's house? How many friends will pitch in to help get her there? And just what was it that Bear needed so urgently? What a treat it was to have Brian Lies present to our Grade 1-5 students today! His animated approach immediately captured everyone’s interest. There were so many ways that he ignited students’ imaginations and sent the message that it is hard work and perseverance that makes one a successful writer/ illustrator. Whether it was in reading aloud his popular Bat series books, discussing/ showing how he generates words and stories, displaying his pages and pages of practice writings and drawings, or reading aloud his work as a second grade student, Brian got his audience thinking. Kids and adults loved his humor, role playing, drawing demonstration, and easy rapport. We thank the PTO and you for providing our students and staff with this learning opportunity that will extend into their classroom reading and writing instructional time.